The global market for cosmetic skin care market witness significant growth in terms of usage. The customers demand for the personal care product differ in various regions. The increasing consumer’s trends on innovation on the part of makers is driving the demand of various product related to the personal care industry. This is one of the important factor propelling the overall market growth of this market. Furthermore, skin lightening and brightening products have the most lucrative market in Asia Pacific. The growing geriatric population in North America is significantly driving the demand of the cosmetic skin care market in coming years. Also, the increasing number of population above 65 years in U.S., China, Japan, Italy and Germany is positively supporting the growth of this market. The cosmetic skin care market is one of the important market influencing the growth of the personal care products in coming years. Also, customers in Argentina and Brazil are highly effected with the dry weather, this led to rise in demand for sun protections products which is another key factor triggering the growth of this market at global scale. one of the important factor boosting the market growth. Not only this, consumer with age of 65 demand for anti-ageing products, but interestingly the consumer with the age of 30 are also demanding for the anti-ageing cream, this is another factor contributing to the growth of the cosmetic skin care market. The cosmetic skin care products are mainly built on the key factor of innovation of several new products. The key participants in this market are involved in research and innovation and are investing more to develop products with more effectiveness such as anti-ageing skin care, skin whitening cosmetics, muti purpose skin care products. On the basis of product type, Muti-utility skin care market is likely to influence the growth of the cosmetic skin care market in coming years. Moreover, based on diverse application and in terms of generating revenue, anti-ageing products dominate the global market for consumer skin care in 2015. The major aspects of cosmetic skin care products are skin rehydration, flakiness, stem cells protection against UV rays, reduce wrinkle and boosting the viscosity of aqueous. Among all these segment, the increasing awareness about the harmful UV rays is likely to propel the demand of the stem cells protection against UV rays. Asia Pacific expected to dominate the skin care market in terms of adoption across the globe. The increasing usage of beneficial product related to skin care in developing economies such as India and China is likely to propel the demand of the cosmetic skin care market in APAC. Growing awareness about skin care product benefits in rural areas is one of the important factor flourishing the demand of this market. On the other hand, owing to the increased disposable income and the increasing spending on the cosmetic skin care products is likely to influence the growth of the cosmetic skin care market in MEA region. This is one of the important factor propelling growth in this region. Also, companies operating in this cosmetic skin care market are adopting key strategies to maintain their presence across the globe. The study also offers few prominent players operating in the cosmetic skin care market such as Unilever PLC, The Body Shop International PLC, L’Oreal S.A., Avon Products Inc., Kao Corporation, and Johnson & Johnson. 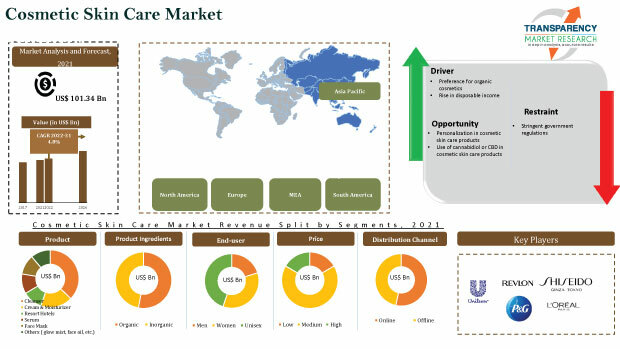 Under the scope of the report, the global cosmetic skin care market is divided into three segments: (i) by product (ii) by application and (iii) by geography.In terms of products, the cosmetic skin care market has been segmented into anti-aging cosmetic products, skin whitening cosmetic products, sensitive skin care products, anti acne products, dry skin care products, warts removal products, infant skin care products, anti-scars solution products, mole removal products, and multi utility products. The multi utility cosmetic skin care products segment includes BB cream (Beauty Balm), CC (Color Correcting) cream, DD (Daily Defense) cream, 7 in 1 skin care cream and solutions. In terms of revenue, anti-aging cream segment held the largest share of the global cosmetic skin care products market in 2015 due to its diversified applications, whereas multi utility skin care cosmetics are expected to be the fastest growing product segment. On the basis of application, the market is bifurcated into stem cells protection against UV, flakiness reduction, rehydrate the skin’s surface, minimize wrinkles, increase the viscosity of aqueous solutions in skin, and others. Others application segment includes removal of black patches and darkness, minimize scars of acne, mole and warts and infant skin care among others. Increasing problem of early signs of aging and changing lifestyle is fueling the demand for cosmetic skin care products. Moreover, rising number of retail outlets and strengthening retail network is anticipated to be the most prominent drivers for the global cosmetic skin care market. Based on geography, the global cosmetic skin care market is segmented into North America, Europe, Asia Pacific, Latin America, and Middle East and Africa (MEA). Each region is further segregated into major country to draw attention to the respective market share of cosmetic skin care in each country. In 2015, Asia Pacific held the largest share of the cosmetic skin care market followed by Europe, North America, Latin America, and Middle East and Africa (MEA). Asia Pacific is largest cosmetic skin care market. However, Middle East and Africa is expected to be the fastest growing region during the next eight years. In addition, Asia Pacific is expected to maintain its leading position during the forecast period. Globally, Asia Pacific is the leading market for cosmetic skin care products due to significant growth in retail sales driven by the huge population in the region and is projected to hold its position over the forecast period from 2016 to 2024. In this report, detail analysis of major driving factors along with key restraints and opportunities (DROs) of the cosmetic skin care market are covered. The research study analyzed the ongoing market trends and provides details forecast for the period from 2016 to 2024. The study covers all major developed as well as developing countries globally. The size and forecast for these markets for the period from 2016 to 2024 has been provided in the report. The report also provides the company market share analysis of key players operating in the cosmetic skin care industry. Some of the key players in this market include L'Oreal S.A., Unilever PLC, Procter & Gamble, Beiersdorf AG, Avon Products Inc., The Estee Lauder Companies Inc., Johnson & Johnson, Kao Corporation, and The Body Shop International PLC among others.